Images slow to load over Wi-Fi on your Android device? Try this. Poor tech installation = problems. I recently noticed my Verizon Samsung Galaxy S5 (SM-G900V running Android 4.4.4) was really slow at downloading images on Instagram, Trivia Crack, etc., but only when connected to my ASUS RT-N66U home router. It was very snappy at doing the same on 4G and on Wi-Fi outside of my home. Phone speed test results using my router were excellent: 101 Mb/s up, 10.25 Mb/s down, 21 ms latency, 0% packet loss. Wireless link speed was 300 Mbps. No other wireless client in my home had this issue. Clearing the Android system cache. Clearing Google Play Services data. Toggling router DNS between ISP and OpenDNS. Enabling/disabling DoS prevention on router. Forgetting SSIDs in Android and reconnecting. Restoring the S5’s hosts file. Fiddling with almost every other router setting imaginable. This lead me to Google “Instagram slow to download pics over Wi-Fi,” whereupon I discovered this thread. One of the recommended solutions there was to create a guest Wi-Fi network and use that instead. I did so and found that it fixed the image download problem, which meant that the fault was neither with my router nor my phone, but with a device on my regular LAN. I subscribe to Mediacom triple play service that includes TiVo whole home DVR and VoIP phone service. 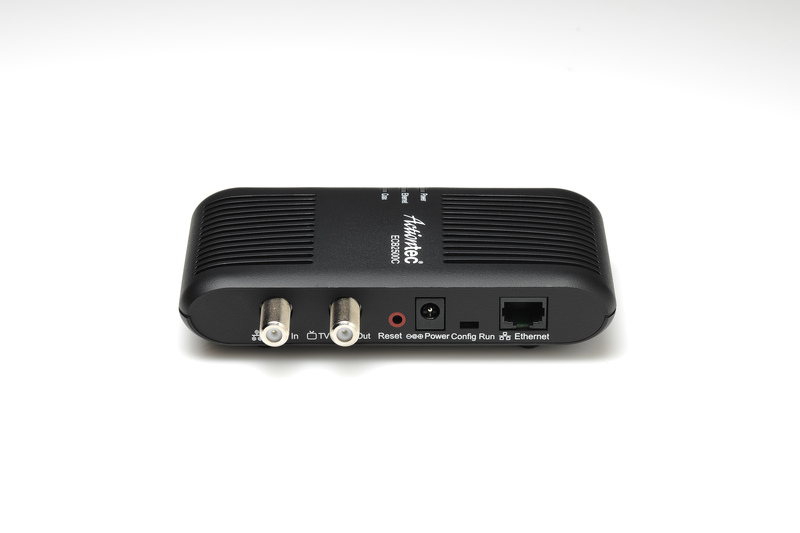 The TiVo DVR and Mini units are connected to the LAN via an Actiontec ECB2500C MoCA Network Adapter as described here. The VoIP uses an ISP-supplied Cisco DPC3208 VoIP cable modem the Mediacom installer had connected to one of my gigabit switches. Note that the Cisco is separate and distinct from my own Motorola SURFboard SB6120 DOCSIS 3.0 modem that is my true internet gateway. I started disconnecting devices from the LAN and checking the S5 after each one. Upon disconnecting the VoIP modem from the LAN, I saw a slight improvement. Upon disconnecting the MoCA adapter, the problem went away entirely. Unfortunately, disconnecting the Actiontec KOed the TiVo service’s internet connection. After connecting the adapter to 1 of my switches instead didn’t work, I put it back where it was. I left the VoIP modem disconnected from my LAN since I could live without VoIP – I use my cellphone for calls anyway – but absolutely needed TiVo to work. Eventually I wound up with nearly everything on my network powered down: the adapter as well as all TiVo devices, PCs, switches, game consoles, and TVs. I then powered up the devices in the following order: MoCA adapter, cable modem, router, VoIP modem (without reconnecting it to the LAN), TiVo head unit, Tivo Minis (in sequence), and then PCs. That fixed the problem completely. I suspect the problem was the VoIP modem presented itself as an internet gateway to some apps on my S5, causing them to try – and fail – to use it to download media. Power down literally all the networking equipment you have, including MoCA adapters, modems, switches, cable/satellite boxes, etc. Power everything back up in the order I specified above. Author jdrchPosted on 2015-03-22 Tags Actiontec, android, ASUS, Cisco, DPC3208, ECB2500C, how to, Instagram, Mediacom, RT-N66U, Samsung, Samsung Galaxy S5, SM-G900V, Trivia Crack, Troubleshooting4 Comments on Images slow to load over Wi-Fi on your Android device? Try this. The MoCA adapter won’t break your internet connection, but you’ll be missing some channels. Yes, the adapter must be installed between your modem and your coax wall outlet despite the TV/STB Out label on the coax output port. That port actually connects to your modem. Yeah, don’t mind that TV/STB Out label. It’s incorrect. Like me, you’re probably worried that placing any device between your router and wall outlet might impact your internet connection. Fortunately, there’s nothing to worry about. Speed and remote access still work just fine. If you decide to switch anyway, be sure to contact them and request the above. Here are Mediacom’s DNS IP addresses, but you won’t want to use them. Benchmarking these against OpenDNS and other free DNS options using Namebench or DNS Benchmark reveals Mediacom’s servers to be 52.1% slower. This isn’t surprising since both the above locations are much farther away than OpenDNS’ Chicago servers. Combined with Mediacom not implementing DNSSEC while OpenDNS has implemented DNSCurve, as well as OpenDNS’ better feature set, it’s a good idea to use OpenDNS instead. Recently I set up a Netgear WNDR3300 wireless router with a Thomson (since renamed to Technicolor) DHG574 DOCSIS 3.0 cable modem on Mediacom. The router had worked perfectly with a previous CenturyLink DSL modem, but was now unable to maintain an internet connection. The Internet LED (the middle one in the above picture) would turn green initially, only to get stuck on amber soon thereafter. Connect to the router directly using a physical Ethernet cable. Power cycle the cable modem. Repeat Steps 1 – 5 only in the above link so that the router indicates that is has a Dynamic IP connection. Check to see that the Internet LED is green. If it is, proceed to the step 4 below. Click Basic Settings under Setup in the router admin UI. I suspect clicking any sidebar link that takes you out of the Setup Wizard works, but Basic Settings is pretty safe so I’m going with that. Exit the router admin UI. You should now have a stable internet connection with the internet LED remaining green throughout. Unfortunately, all indications are that you’ll have to repeat this process after every power loss to the router and/or connection loss by the modem itself. It’s probably a good idea to get a new router anyway, but if it’s what you have to work with, this will certainly help.